The RCT4 is a Universal learning device for control of non-McIntosh products in McIntosh systems. It works with all McIntosh keypads. The RCT-4 provides the same functionality of a universal remote control without the disadvantages. 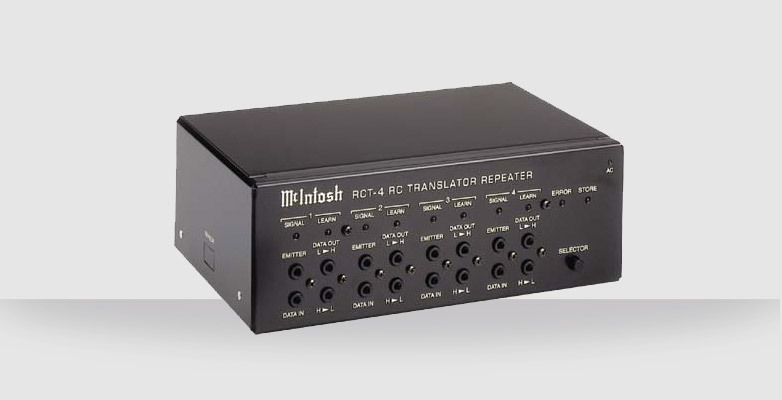 The RCT-4 can translate up to 29 IR (Infra-Red) commands of most other brand components and fourteen commands can be continuous. Four individual translator circuits allow four other brand components to be controlled. The Translator operates from McIntosh Remote Controls or Keypads. Control is possible with IR emitters or by data cables.